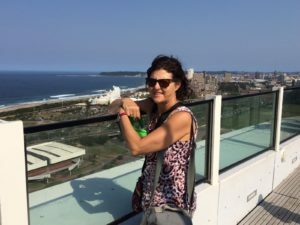 Rhonda Klevansky is originally from Durban, South Africa. She is a photographer, writer and film maker with a strong interest using video and photography as tools for advocacy. She has produced video and multi-media material for non-profits, made independent documentaries and has worked on films for various broadcasters including the British Broadcasting Corporation, the South African Broadcasting Corporation, Television New Zealand and the Discovery Channel. Her still photography spans documentary, travel, nature, landscape and portraiture and has been exhibited in the USA, Great Britain, South Africa and Chile. She contributes photographs to Getty Images and the Nature Picture Library. In addition to video and photography, Rhonda has written numerous magazine articles, reports for non-profits and a non fiction children’s book. Rhonda teaches creative writing and photography at the Center for Documentary Studies at Duke University. She has also taught film literacy and production in a USA high school, mentored young videographers in South Africa, and interviewed clients for the “Medical Foundation for the care of victims of Torture” in the UK. Rhonda currently resides in the USA and continues to travel extensively. She is the director of Ibis Eye Images LLC, in Durham, North Carolina.